Are you prepared for 2011? This is only a general perspective guide for the twelve earthly branches of the Chinese almanac for March 2011. In this, I have attempted to point out the factors that may affect you beneficially this month and also those of which you should beware of according to your animal sign. The effect on individuals should be considered within the context of the monthly Flying Stars. Please do not think that because, for example, you are a Rooster and you read below that March 2011 will not be good, you will therefore have a bad month. No, a positive attitude and hard work combined with knowledge of what the month ahead has in store for you will enable you to avoid many problems and disappointments. For no apparent reason you may feel unusually insecure or anxious. This is a time to be on your guard and to watch out for betrayal especially at work and please try and avoid to overspend this month, it would not be wise. Apart from the above your month will be pretty smooth and trouble free just be aware of the way you are feeling and know that it will pass. All the feelings of possible insecurity will pass and your month can be good for romance and a great month to start a new project or learn a new skill but you must be careful with sports injuries this month or accidents with metal so drive carefully..
To further enhance 2011 take a look at your 2011 annual animal predictions and also the 2011-flying star (Xuan Kong) as you will need to follow the advice carefully to ensure a trouble free year in 2011. You can place your annual cures and enhancers at any time of the year after February 4th 2011. We have an inauspicious #7 star enter the centre this month of March although combined with the auspicious #7 star can bring much conflict and need to make sure your annual cures are in place and introduce some dark blues, black, grey or charcoal colours into the centre of your home as each of the compass sectors are double energy in March and particular care is needed. You should also place a bowl of still water which can be disguised with flowers in a vase but the most important thing to remember is to keep the water squeaky clean. Be very careful in March if your main door, bedroom, lounge or office or any important room is situated in the east or south this month. If your office, main door or bedroom is located in the east or south make sure you place a Wu Lou or six Chinese coins tied in a row with red ribbon for the month of March especially if you are not in good health or feel very stressed. If your bedroom, office or main door is located in the east or south you must set up a salt water cure along with a six Chinese coins tied in a row with red ribbon for the whole year. If you have a main door, lounge, office or any other important room in the north please be extremely careful signing papers as there could be deceit or legal issues in March, just be cautious and read all the small print before signing papers. You can also suffer from someone trying to back stab you or steal from you so place something that is red in colour in the north such as a rug, door mat, sofa throw etc; this will help calm this negative influence. If you use our monthly cures kit place a wu lou and set of six Chinese coins tied in a row with red ribbon in the east and south especially if you have an important room like a bedroom, office, main door etc. 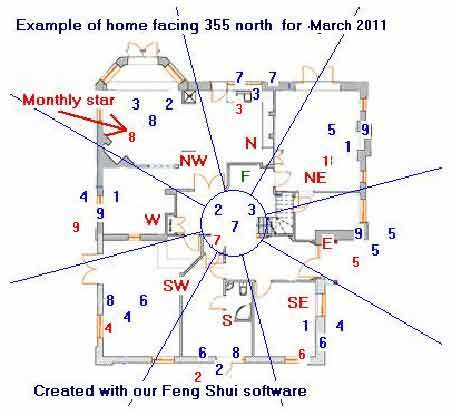 Please also be aware that the #5 annual and monthly star is in the east in 2011 and you must not disturb the ground, so no renovations or such like especially this month. place some strong water colours in the east (blue and or black) especially if this is an office or bedroom, in fact if you have a bedroom or office in the east you should place a bowl of still water in this room for the month of March, the water must be still and changed every couple of days and daily if you live in a very hot dusty country. Good sectors for the month of March are the northwest, west and northeast and if your door, office, bedroom or any other important room is located in these areas your month will be good in March. To activate relationships in March you can place something dark blue or black in colour in the southwest. A quick and easy way of introducing the colour is placing a sofa throw, bed cover, rug, table cloth; it is actually very easy if you think about it. If you use symbolic items in relations you can place a pair of Mandarin ducks or double hearts in the northwest and southwest this month. With regards to wealth you should spend more time in the northwest of your home or office and enhance the northwest by placing a faceted crystal sphere and/or a real piece of quartz crystal. Be very careful on the 7-19 & 31 March as this is year breaker, month breaker sha day and not good at all so please do not plan any important tasks for this day. If you would like to be better informed of good and bad days check our free monthly almanac or our powerful date selection Tong Shu almanac software. To prevent legal issues, disputes, gossip and arguments with partners in love or business, introduce something red into the north corner of your home and bedroom or office in March, a quick and easy way of introducing the colour is using a sofa throw, bed cover, rug etc, you can also light a small candle daily if you are experiencing problems on this front but please be very careful with candles and tee lights. Take a look at your 2011 annual animal predictions and also the 2011-flying star (Xuan Kong) as you will need to follow the advice carefully to ensure a trouble free year in 2011. You can place your annual cures and enhancers at any time of the year after February 4th 2011. This is a good month and, for some, there is good advancement in their romance. For others, however, any newly developed romance is likely to be short lived. Do not act hastily in order to avoid your feelings being hurt too intensely. To enhance romance this month, place some crystals in the northwest of your home or bedroom and if you use rose quartz or amethyst it is even more powerful. This month is much better and you will enjoy success at work and happy relationships in your dealings with others. However, you are not free of dishonest people around you who may take advantage of your kind heart and draw the conclusion that this is a form of weakness especially if you have a main door in the north. If you get upset by others try not to let it get you down as it can affect your health so please take care of yourself both mentally and physically. For protection against physic forces wear some hematite beads or amethyst. Your lucky sector is the North-Northeast (22.5º – 37.5º) of the home or office. If you want to enhance or attract new relationships place a pair of mandarin ducks in the northeast and/or east part of your bedroom this month. This a fantastic month ahead and you will be rewarded for your compassion and kindness and for any good seeds you planted last year they should come to fruition. On the financial side, if you are looking at investment opportunities, this would be a good time to think seriously about them but be very careful when signing papers. Try and spend some time in the northwest of your home or office and place some crystal here to enhance. Those of you born in 1962 should be careful not to get too stressed this month and those born in 1950 beware of gossip and slander. Be careful if your bedroom or office or any important room is located in the east or south this month and make sure you follow the monthly flying star advice below. There is a clash of elements during the month of March and there is a strong probability that you will encounter difficult times and so do not be reckless in your actions. This will seem strange for the Rabbit as they have enjoyed a good time so far this year, do not be concerned though just be careful this month and take no risks. Be cautious not to get involved in arguments at home or work as they will not go in your favour. This also applies to any possible legal problems, make sure you deal with them and do not postpone dealing with them as they will grow. Those younger Rabbits born in 1975 & 1987 male or female should be careful of accidents involving metal and in particular cars or bikes, please keep an eye on them and maybe give them a lecture on road safety this month. If you have children who are sitting exams try and encourage them to study in the northwest this month and place a crystal ball or globe beside their desk. This month will not be that bad although do not get sidetracked by becoming involved in the schemes of others. You must be true to your principles, whether in the form of promotions or recognition will be yours. Should you have decided to help someone in need, you must refrain from getting emotionally involved in your dealings with them. Select your friends sensibly and at some time this year you will find who your true friends are, this will be a good time for you. You need to be careful of what you eat and drink and be very careful if visiting hot countries and watch the food you eat. Enjoy a great March. This can be a very good month for romance. Your lucky sector is the East-Southeast (112.5º – 127.5º) of the home or office. Place a cluster of clear crystals or gemstones in the east sector of your room to enhance wealth in January. If you look at the bigger picture, you can see the rewards on offer. It is imperative that you preserve harmonious relationships with those around you especially at home. Do try to keep away from gossip and small minded discussions; they will cause you many problems if you get mixed up with them. Be aware of people offering you investment opportunities that seem to good to be true, you can be vulnerable this month and do not gamble at all this month and this applies to investments etc. March is a good month; you just need to be a little more cautious than normal. Wear a hematite or Tiger eye power bead to keep you focused and an amethyst one for keeping you in good health. A strange month for the Horse although you can get satisfying results both in work and relationships. Harbour an attitude where you are able to solve problems and with confidence. But in times like this, you have to be careful with the people you are acquainted with and do not get trapped by devious plans resulting in loss of wealth, it could be linked to investments especially if it involves property, so be careful with how you part with your money. Arranging outings or holidays with their family may help improve the health and quality of family life. Events will flow smoothly for Goat as long as you keep a low profile especially for the female Goat. If you do not, the elements will work against you which may well result in you suffering setbacks and difficulties in your endeavours both at work and in relationships. When dealing with people try and keep your emotions cool as your hot head can get you into deep trouble, so a diplomatic approach is needed this month and really throughout the year. Wear a hematite or Tiger eye power bead to keep you focused and an amethyst one for keeping you in good health. Be very careful when signing contracts this month and ensure you double check all documents. Young Goats/Sheep born in 1991 should be very careful what they eat this month and if you live in a hot country make sure they drink plenty of water. This is the ideal time to plot and plan your ideas and projects. This may well turn out to be a pleasant but rather busy month. This is one of the best times in the year for you to write down all your personal goals and place them in the northwest of your home in March and for the rest of the year but make sure it is in a place that you can see it daily and one by one try and achieve all that you have written down. This is a month to pay special attention to your health so please try and take time out to rest especially if you are an older Rooster. This is so important this month. It is not all bad though as you could receive some unexpected good news. This month in particular it is important to have protection and having a symbol of a Dragon close to you is vital to help ease any problems. Be on your guard this month and be very careful when signing papers or falling trap to scams, please be careful in all respects this month. Be careful this month but also expect that the month presents opportunities for advancement, promotion and new ventures for those in business. However, it is important to bear in mind the need to be charitable in your outlook to those around you. March can be a good month and potential for new romance, if you are looking to enhance relationships place a Dragon Headed Tortoise in the northwest of your home or office. Be careful of diet in March and avoid too many takeaway foods as illness can strike especially in relations to chest problems and flu/colds. Although wealth and career may be good, relationships may suffer some setbacks. In the midst of the excitement and diverse activities brought on by the dynamic energy of the month, be mindful of whom your friends are and avoid gossip and bickering. The elements of the month may frustrate you and put you in an irritable state where tempers ignite easily. Know this and keep control of yourself. It is important to stay away from squabbles. Spousal conflict is possible if you do not adopt a ‘give and take’ attitude. Communicate with your loved ones, family and friends and try to be understanding. Harsh words are best left unsaid. Remember you’re the one who can make the difference. Whatever your dream is, go for it. I hope you have enjoyed reading this information. As I said at the beginning, if the prediction for your earthly branch (animal) is not so good this month, you can avoid any potential problems by following our advice above and also by being aware of the monthly flying stars. To further ensure a smooth month ahead in January and for more information on the monthly Almanac and choosing auspicious days follow this link.